Gone are the days when buyers were loyal to particular brand or sales channel – the silos of shoppers who only bought online or those who choose to buy only in the brick and mortar stores are crumbling away. Today buyers demand convenience, convenience not in the general way but convenience in the context of the buyer. For example, e-commerce might not be a convenient option when you have to buy a gift on your way to a party. To keep consumers happy, retailers have no other option but to give in to their demands and offer them the flexibility they desire. One such flexibility buyers demand today is Buy Online Pickup in Store (BOPS). BOPS offers amazing flexibility and benefits to both buyer and retailer. BOPS makes it is easier for buyers to search, evaluate and purchase products online and pick up in a store. It plays to the emotional “connect” aspect of a shopper, which is generally established during a visit to the physical store. Offers the brand an opportunity to better engage with buyers in-store. 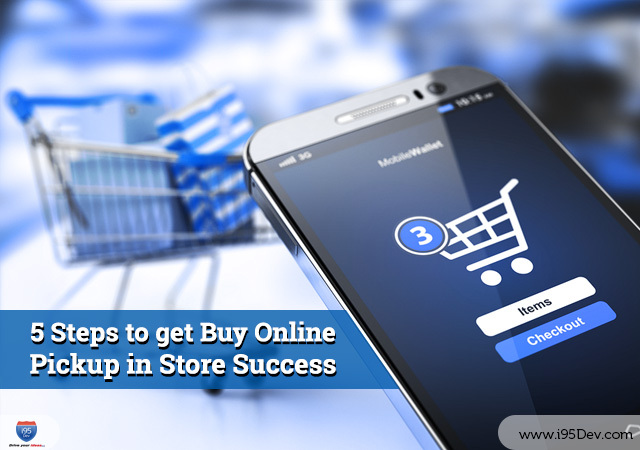 Read Advantages of Buy Online Pickup In Store for more details. Despite the benefits to buyers and retailers alike, retailers sort of delay offering this for reasons ranging from lack of capability and expertise to budgets. Refer Challenges with Buy Online Pickup in Store (BOPS) for more challenges. In this article, we will list down a few steps to effectively overcome these challenges. The items in the order are available in stock at the retail location (it is important to ensure that either the inventory is blocked at the physical location or is delivered on time from the warehouse to the physical location), and more. For this process to work seamlessly business must ensure that the e-commerce store and brick-and-motor stores are integrated. While you offer the flexibility to BOPS to your customers, ensure that the customer experience is consistent on both the channels. Revisit your policies and procedures in the context of the BOPS scenario if required. Define clear guidelines about the BOPS process, do you allow returns and if yes how are returns handled, what will you do with the products returned, how will sales commissions be handled, etc. The experience derived by the shopper in the store is the defining moment for his loyalty. Train your store representatives to align with the processes, to leverage the cross-selling and up-selling opportunity, etc. During holiday season buyers leveraging BOPS might be higher which might require you to scale up efforts for smoother operation. Revisit the store format to accommodate the hybrid purchase models of online shopping and in-store pickup services. While disconnected in-store and e-store models are straightforward and require minimal investment in renovations, BOPS might require you to make some changes – depending the order volume you might have to offer drive-thru, kiosk or curbside pickup options. However, ensure that at each step of the way the customer does not lose connect with the “brand”. In-store pickup as a service demands frequent analysis and a close eye on numbers. With the growth of service volume, the staffing and other needs will climb and processes will need reviews from time to time. Remember that shoppers will always be insatiable and will constantly expect better service with each transaction. Stay prepared to beat yourself at this game. The customers dictate terms in the shopping experience they wish to experience today. But, before you jump to conclusion ensure that you are completely aware of the economics of different kinds of fulfillment methods and their impact on customer satisfaction. Contact i95Dev to integrate your Magento e-commerce and POS systems and take advantage of the BOPS opportunity and much more.